KANSAS CITY, KAN. ----- The co-coach of the year, the Region VI most valuable player, an All-Jayhawk/All-Region selection and the all-time leader in assists led the way as Kansas City Kansas Community College made a sweep of women’s post-season basketball honors. Valerie Stambersky is the Jayhawk East Co-Coach of the Year and freshman forward Cheyenne North a first team All-Jayhawk East selection while sophomore guard Cierra Gaines was named the Most Valuable Player on the NJCAA Region VI Division II team. 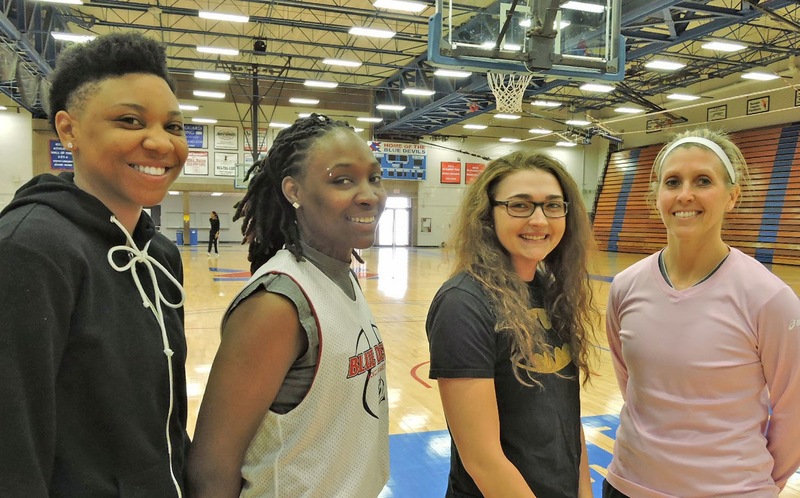 North and Gaines were both named to the All-Region team while Gaines was named to the second All-Jayhawk team and Cassidy Harbert, KCKCC’s all-time career leader in assists, to the honor roll. Washburn, who led Coffeyville to the Jayhawk East championship at 12-1. It is the first Coach of the Year honors for Stambersky, whose Lady Blue Devils came within one win of gaining the NJCAA Division II national tournament. The second most wins in a season in KCKCC history, the Blue Devils shared regular season Division II conference honors with national champion Johnson County at 11-1 and finished in a tie for second with JCCC (11-2) in the Jayhawk East behind Coffeyville (12-1). Second in assists in a single season with 197 as a freshman, Harbert added 162 more this season and vaulted to No. 1 on the all-time assist list with 359, eclipsing the old record of 352 established by All-American Aneta Kausaite in 1994-96. A sophomore from Wichita Northwest, Harbert was also second in rebounding (5.2) and fourth in scoring (8.1).